All of my kids developed extensive vocabulary skills rather quickly, and I credit that to one thing. Exposure. Exposing children to a rich vocabulary through natural conversation and living books are the two best ways, in our experience, for language acquisition skills to develop rapidly. When I was offered the chance to review WordUp! and the boys watched the sample video with me, they were excited! They love learning new words and meanings, so I was happy to review it with them. Word Up! 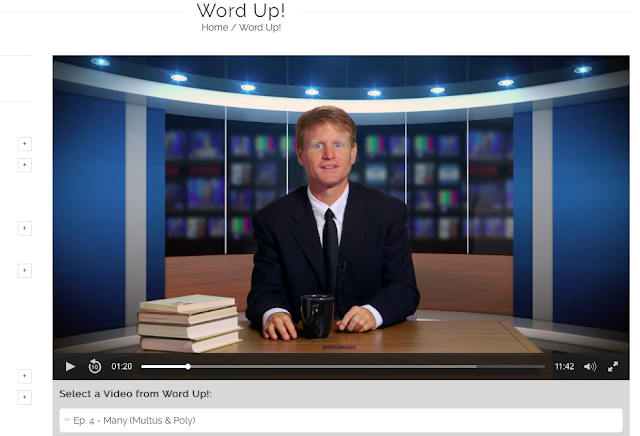 is an engaging vocabulary video from Compass Classroom. Hosted in a news show style format, Dwane Thomas teaches Latin and Greek roots to help students expand their English vocabulary. It's specifically designed to help students with science, literature and standardized tests. 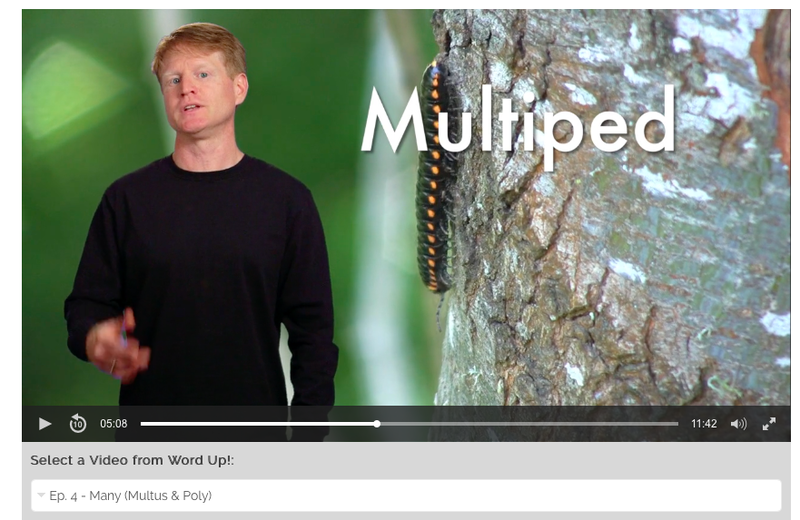 There are 10 lessons, and each lesson focuses on both the Latin and Greek root for one English word, and then those root words are shown in a new context for students. So for the English word "water," we learned the roots Hydra and Aqua, and words like aquatic, aquanaut, aquifer, hydrant, hydrate, hydrogen, or hydrangea--every grandma has one! This course is great for audio and visual learners. Auditory learners will have the obvious benefit of hearing the words and definitions, while visual learners can see the word on the screen with associated video. Everything is completely broken down for us, too. From the Latin word Multus we get many. Pes or Ped in Latin means foot. Something that has many feet is a multiped. Dwane Thomas uses a wry humor that is generally very appealing for most kids. The videos are aimed at students 10 years and older, and I would say that's accurate. I used it with both of my boys, and the ten year old caught a lot more of the subtle humor than did his seven year old brother. Both boys enjoy the videos though, and I really do not think it is too advanced for my youngest. Truthfully, vocabulary is only words, and difficult words are not something we avoid in our home. Also, since this is being taught in the context of "all these words have the same root, and therefore have similar meanings . . . " it is very easy for younger, eager children to follow. If nothing else, it is excellent exposure. Word Up! has quizlets available for each episode, which is a great way to practice, review and quiz the vocabulary. At this age, we're just using the lessons for fun, but for older students, I would certainly use these additional resources more thoroughly for language arts credit. You can purchase Word Up! as a DVD, a download, or through streaming. We have the Streaming version, and I can sign in, click on "my streamable products" and click on the product to start watching. It's very easy to navigate. My kids enjoy these lessons and ask for this video, and I think that says a lot! You can try a lesson of Word Up! 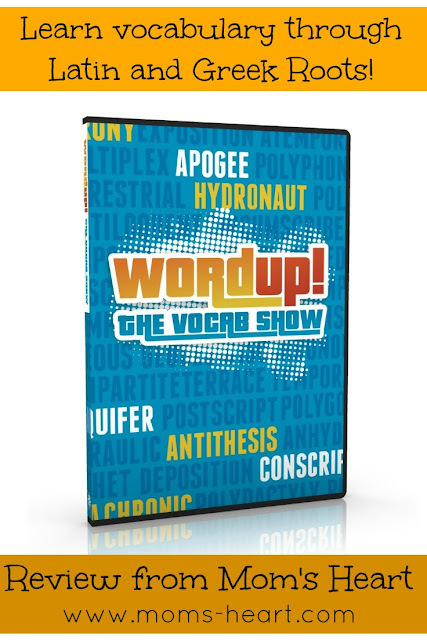 for FREE, but Compass Classroom is generously offering a copy of Word Up! to one of my readers! This giveaway is open internationally. U.S. residents will have a choice of DVD, streaming or download. If the winner is out of the United States, you will have the option of streaming or download. Must be at least 18 years of age to enter. Void where prohibited by law. Odds are determined by the number of entries. The winner will be selected at random, the winning entry verified, and will have 48 hours to respond to email. If the winner cannot be verified, or does not respond in that time frame, a new winner will be selected. The product offered is free of charge, no purchase necessary, and will be provided by Compass Classroom. Mom's Heart is not responsible for prize fulfillment. Facebook, Twitter, and Pinterest are not affiliated with this giveaway. We don't teach formal vocabulary in our homeschool, but my kids have a great vocabulary! We don't usually teach it formally either, but this is a fun video that we couldn't resist, and it doesn't feel "formal" or forced at all! I like to play games and do anything I can to make it fun! For example, I play a game like Hangman (but without the hanging part), Tic Tac Toe, Word Scrambles and Other Puzzles with definitions as clues, Mother May I where I give the definition and they give the word, etc. I really enjoy teaching word parts so that children can expand their vocabulary knowledge. These all sound like fun and engaging ways to learn vocabulary! Most of my kids' vocabulary learning comes naturally during read-alouds or other activities. My kids do like playing vocab games too like when they try to stump each other with new words.